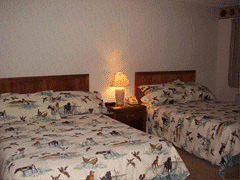 The motel features 16 units, with handicap accessible facilities. Each spacious room has such amenities as two queen size beds, or one queen size bed, cable TV, telephone, air-conditioning, blow dryer, and separate bathroom/vanity areas and wireless internet. A continental breakfast is available in the breezeway that was added to connects the Motel to the Resturant/Black Bear Lounge and this also provides handicap access to Black Bear Lanes bowling alley for the convince of you our valued guests. WELCOME SNOWMOBILERS! Save with group discounts. Plenty of Parking. Trail #1 right outside the door!